Eureka Springs is a fun, quirky little town with a vibrant nightlife. Admire the motorcycles over a drink at the Cathouse or watch a bikini contest on bike night at the Rockin Pig. Live a little. Let Stonehouse choose a perfect if not adventurous wine to accompany a variety of cheeses. Watch dancing girls at Vous la Vous or hang with the locals at Chelseas. Much of Eureka Springs nightlife is located downtown. If you want to bar crawl, consider the convenience of staying downtown. Eureka Springs downtown lodging is within easy walking distance of all the hot spots. Learn more about Eureka Springs Nightlife. Everyone loves to shop in downtown Eureka Springs. Eureka Springs is home to dozens of fine art galleries, specialty shops, jewelry stores and more. Find the perfect gift or memento from your trip and have fun exploring Eureka Springs. Learn more about Eureka Springs Shopping and Eureka Springs downtown. Eureka Springs was made famous because of its location near so many natural springs. For centuries, Eureka Springs has been a destination to relax and rejuvenate. Today, Eureka Springs is home to world class spas offering all of the latest in spa services. Find an individual massage therapist or spend a day in the spa. You might even save money booking a spa package. Check out Eureka Springs Spas and Eureka Springs Spa Resorts. 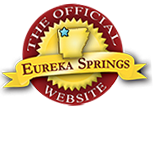 Learn more about Eureka Springs Spas. Want to catch up on your sleep? Sleep late in one of Eureka Springs cabins, cottages, motels, treehouses, bed and breakfasts and historic hotels. Eureka Springs has lodging to fit everyone’s preference and budget. From Best Westerns to Choice Hotels, you can redeem rewards with your stay. With a designation from the National Register of Historic Places, Eureka Springs is home to many beautifully renovated Victorian Bed and Breakfasts and historic hotels including a Historic Hotel of America, the famous 1886 Crescent Hotel. Located near Beaver Lake, the White River and the Kings River, Eureka Springs and Eureka Springs West has rustic and luxury cabins for a more secluded stay. Learn more about Eureka Springs accommodations. This entry was posted on August 11, 2012 by estcblog in Basin Park Hotel, Crescent Hotel, Eureka Springs Lodging, Fun Downtown, Shopping, Spa, The Great Outdoors, Things to Do and tagged Arkansas, art galleries, dining, downtown, Eureka Springs, Fine dining, food, historic downtown, historic hotels, natural springs, Top 25 Arts Destination, wine.